These adorable sweaters will keep your four-legged kids warm in cooler weather! Available in sizes from tiny to XXXL, there's a sweater for every dog! Handmade by the Inca Artisans in South America. We have always followed fair trade guidelines, are made from 100% wool and use plant dyes. Chilly Dog has been able to employ many knitters in healthy workplaces, and enable them to support a better lifestyle in their small villages by being paid a fair living wage. Chilly Dog keeps up with the latest trends to keep dogs fashionable as well as warm. 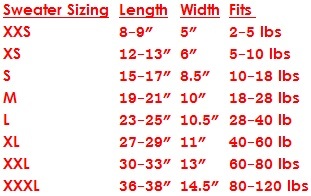 Our sizing can fit a tea cup dog to a great dane. These are the warmest and best quality sweaters you will find out there! Don’t let your dog be left out in the cold! All sweaters are handmade & may vary slightly in color & style. Hand knit wool dog sweater made in 8 sizes to fit every dog!